I put "fire" in my eggs! I LOVE you all ~ Seriously! Even when I wasn’t able to post, you STILL commented on my I can’t post, post! Thanks, you all made my LONG day so much better! Before I hop into today, let me just quickly share my rockin’ Body Bugg totals for yesterday ~ I am soooo proud! I didn’t input calories but I know they fall into 1,200-1,500 as the entire Bikini BootCamp Book meals do. Ok, onto today….I got up bright and early to fit in ALL my workouts this morning. I whipped out 60 minutes on the treadmill followed up by circuits, 10 minutes of meditation and 15 minutes on Sun Salutation Yoga. Can I just say I am soooo sore…The Husband laughs at me when I get up to walk anywhere. 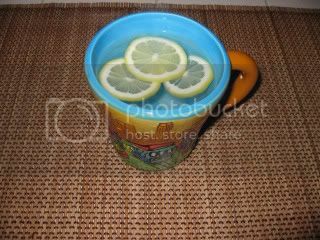 I sipped on my Morning Burst (hot water plus lemon slices) while I got ready. 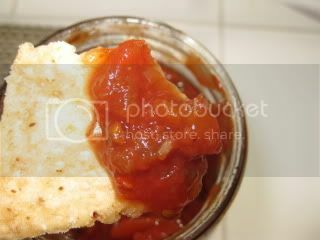 Today’s BBC breakie called for hard boiled eggs with salsa. Is it just more or does that sound funky monkey?! Angelea followed the plan and I probably would have too if I got to use her super cute egg boiler! 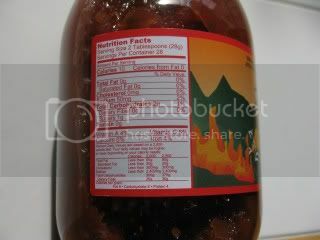 Instead, I took my eggs to a whole new level by add some “fire“ to them! Do you all remember when I won Julie GoLean’s Big S Farms Salsa Giveaway? 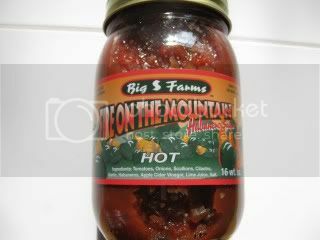 I’ve had my jar of “Fire on the Mountain” sitting on my counter just screaming for me to try it. Check it out – I LOVE the ingredient list – it’s 100% clean with nothing funky added – you can recognize EVERY ingredient in the jar! And who doesn’t LOVE a salsa that has only 10 calories a serving! 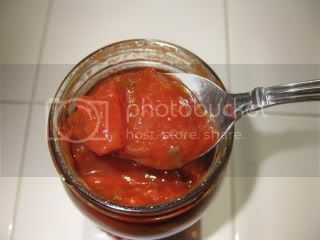 I LOVE the chunkiness of the salsa…..It looks so fresh when you open it up. Salsa BELONGS with chips – especially Lundberg Sea Salt Rice Chips! So, to kick off the morning hours……. The Husband tested it out for us! Ha ~ no, I didn’t break my Bikini Bootcamp Challenge and I didn’t have chips with salsa before noon. He LOVED the salsa with the chips while I ate it off the spoon (because I am a cave girl like that!). It has a nice spice, but, it’s not so hot you cannot handle it. To me, it’s the perfect like medium spice and you can really taste all the flavors in the salsa. I can tell they used a good quality tomato because there is a hint of sweetness to it. 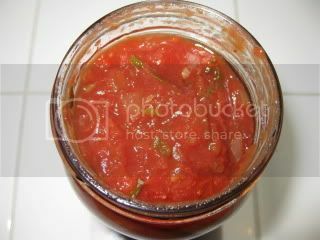 I used my “Fire on the Mountain” salsa and mixed it in with 2 organic eggs and a little freshly made, Salsa Mexicana. You can click HERE for that recipe. All cooked up in a little non-stick cooking spray. With a little more “Fire on the Mountain” salsa on the side. 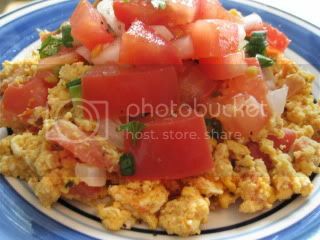 I LOVE eggs with salsa! This breakfast kept me going ALL morning long through the delivery of our new fridge. Pictures coming soon! 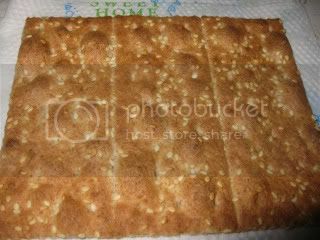 I did snack of a few of my Secret Bloggie AkMak Sesame Crackers on my drive into work. I am SO SAD that these are almost gone – I need to find them ASAP! Coming up next, a few fridge pics plus my lunch and dinner recaps, fun mail and more! I found Ak Mak at Raleys/Nob Hill or Safeway! That egg dish looks fantastic! Eggs + salsa is a great combo. those eggs look SO FREAKING GOOD. for reals! im so having eggs tomorrow! C.G ~ Thanks – I am going to have to check out Safeway. I looked at Raley's the other day and they didn't have them…maybe I wasn't in the right section? K ~ We have TJ's…haven't you noticed my sick addiction to that amazing store 😀 LOL. It's true, you can totally recognize all the ingredients in the salsa. Anne ~ Thanks, I am really trying to feel the "burn" LOL. 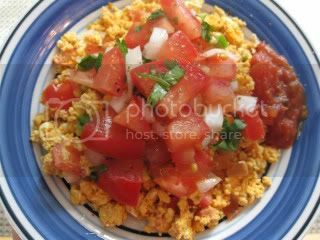 Janetha ~ Glad I can make you crave eggs 😀 LOL I LOVE salsa with eggs – so easy and so flavorful.